Laser-produced plasma sources for the soft X-ray region (1 - 20 nm corresponding to a photon energy between 1200 eV - 60 eV) are widely used in spectroscopy, extreme ultraviolet (EUV) lithography and X-ray imaging. To qualify these sources, the emitted absolute photon numbers are of special interest. The characterization of the spectral emission of the source is crucial e.g. in EUV lithography or in X-ray microscopy. In both cases, the control of the exposure process requires the exact knowledge of the photon numbers. Various kinds of spectrometers have been developed and applied to characterize laser-produced plasmas. A very compact spectrometer consisting of a transmission grating, a slit and a back-illuminated CCD camera was firstly proposed by Wilhein . Fig. 1 Photograph showing the compact transmission grating spectrometer together with an Andor iDus X-ray CCD detector. The working principle of the soft X-ray spectrometer is very simple: the X-ray source projects a shadow of the grating-carrying slit onto the detector. In the detector plane a diffraction pattern occurs at position x=λ B/D with λ: wavelength, B: distance grating-detector and D: grating period. For a compact soft X-ray spectrometer (Fig.1) the research group used a setup similar to . The spectrometer consists of a filter (thin Al, Cr or Ti foil) for the suppression of VIS/NIR light originating from the laser, a transmission grating (10,000 l/mm), a slit (500 μm x 50 μm) and a back-illuminated X-ray CCD camera DO420A-BN with 1024 x 255 pixels (pixel size 26 μm) from Andor Technology. In order to make the whole setup very compact and to make the alignment easy all X-ray optics were placed inside standard KF40 flanges. The CCD camera was delivered by Andor with a space saving custom flange. Using a self made interface flange it was possible to connect the CCD camera directly with KF40 tubes to the vacuum system. In order to choose easily the desired wavelength region, the CCD camera was attached to a stage moving on a bar (Fig. 1). The whole setup fits to a base plate of 300 mm x 500 mm. It was completed by a small turbo pump (Pfeiffer Vacuum) to guarantee a base pressure in the spectrometer of 10-6 mbar. All measurements were carried out with a cooled down CCD camera chip at -45 °C. Fig. 2 Spectral sensitivity of the Andor back-illuminated CCD camera DO420A-BN with 1024 x 255 pixels measured at PTB BESSYII beamline Berlin. The calibration procedure for the CCD camera, as well as for the transmission grating, was performed at the radiometry PTB BESSY II beamline. In a first step the CCD camera was calibrated within an photon energy range of 70 - 1900 eV (corresponding to a wavelength region 18 - 0.7 nm). The results are shown in Fig. 2. The average error of the calibration procedure was < 5%. In a second step the slit and the transmission grating were added and the relative intensities of zero and first order diffraction patterns were obtained. From these data the grating efficiency in the range 100 - 600 eV corresponding to a wavelength region 12 - 2 nm was calculated. It was found that the experimental curve (data not shown) in principle follows the grating efficiency calculated using the Henke data , taking into account a thickness of the grating support of about 100 nm. The maximum grating efficiency in the water window (2.2 - 4.4 nm) amounts to 0.015 with an average error of about 20%. The transmission of the filters (Cr, Ti) used in the experiments to block the visible light of the laser was determined ‘at wavelength’ comparing the counts on CCD camera with and without filter. The compact transmission grating spectrometer was applied to experiments with a liquid nitrogen jet  target system. The driving laser was a Nd:YAG laser (Quantel BRILLIANT) with 3 ns, 120 mJ, 10 Hz output at 1064 nm focused to a 15 μm diameter spot, resulting in an intensity of 3 x 1013 W/cm2 applied to the liquid nitrogen jet. The grating was placed in a distance of about 500 mm from the source. Together with a grating-detector distance of 400 mm and a source size of about 20 μm the calculated spectral resolution  amounts to λ/Δλ = 100 at 2.48 nm, the design wavelength of the laser plasma source. The measured spectrum is shown in Fig. 3. The spectrum consists of different lines assigned to different ionization stages of nitrogen. Two series are observed: the H like emission lines of N-VII ions and the He like emission lines of N-VI ions. 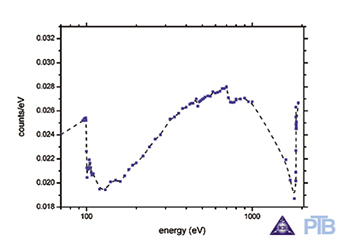 From the experimental data a linewidth of 0.02 nm for the Ly-α line corresponding to a spectral resolution of about 100 was found in agreement with the calculated value. Using the calibration data for the CCD camera, the grating and the Cr filter the photon flux was estimated to 4 x 1011 ph/pulse sr for the He-α line and 3 x 1011 ph/pulse sr for the Ly-α line. 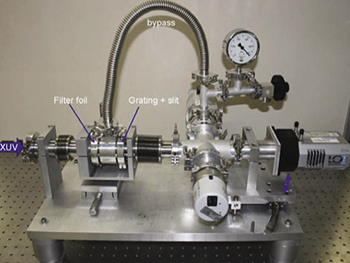 Wilhein, T., et al., A slit grating spectrograph for quantitative soft X-ray spectroscopy. Rev. of Sci. Instrum., 1999. 70(3): p. 1694-1699. Jansson, P.A.C., U. Vogt, and H.M. Hertz, Liquid-nitrogen-jet laser-plasma source for compact soft X-ray microscopy. Rev. Sci. Instrum., 2005. 76(4): p. 043503/1-5.